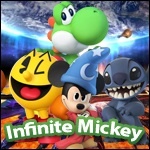 Disney Infinity Fans • View topic - Biweekly art series! Every other week I will make a piece of Disney art! And yes, I will take suggestions if they are related to Disney! Here's the first piece! Skip to the end if you want to see the final product!